Clairobscur is an excellent example of high quality, classically based concert dance that is right here in the Los Angeles indie dance scene. The dancers must be recognized for their excellence both in technical skill and performance technique. Sefton has created a company that is mature and convincing. Saturday’s performance at Diavolo Dance Space highlighted the dancers’ skill and Sefton’s passion for personal narrative. The evening began with Werk Work, a piece choreographed in 2014 for a site specific environment in San Francisco. The five female dancers were dressed in boldly colored business shirts and black slacks, entering with a stylized slow motion run that was punctuated with accents like cogs in a wheel. The theme of the hustle and bustle of business life was clear from the beginning, as dancers mimed cell phones, paper work, and business chats. The dancers’ bound flow and angular shapes generated a clear feeling of controlled aggression while communicating a duplicitous focus. The dancers’ ballet training served them well, as they gestured with legs and arms in complex patterns (sometimes in extended balances). What pleased me most about this work was the strong use of rhythm and syncopation in the dancers’ footwork. Although the sneakers didn’t quite fit for me aesthetically, it did allow the dancers to pound the floor in complex patterns of stepping, chugging, and stamping. I could easily see how the dancers’ quick foot work may have evolved out of their petit allegro skills as they traveled effortlessly through the syncopated sequences. The second piece, Obviam Somes, translating roughly from Latin to “against the body,” included the use of video projection behind the dancers for the length of the work. Manipulated video images, created by Erik Lohr, included a petri dish of cells, the inside of a blood vessel, a live shot of someone’s viscera, and finally a smattering of pills and capsules. These medical images, combined with the sheer dressing gowns on the dancers, conveyed a clear narrative of illness and, for me, cancer. The visuals were well paced and elegantly integrated into the work, leaving plenty of time for the audience to see both the video and the dancers’ movement without getting overwhelmed. The choreography for this piece was widely diverse including elegant balletic line, strong contemporary gestures, and moments of an Africanist aesthetic in the use of the torso. One of the most memorable moments was also the most disturbing, including the graphic representation of the dancers performing surgery on each other. The weakness of the piece lays in the choppiness of the piece as it moved from section to section which resulted in a scattered arc for the work as a whole. Despite that, the overall power of the piece, the sheer athleticism of the dancers, and the imagery of illness and death was stunning. 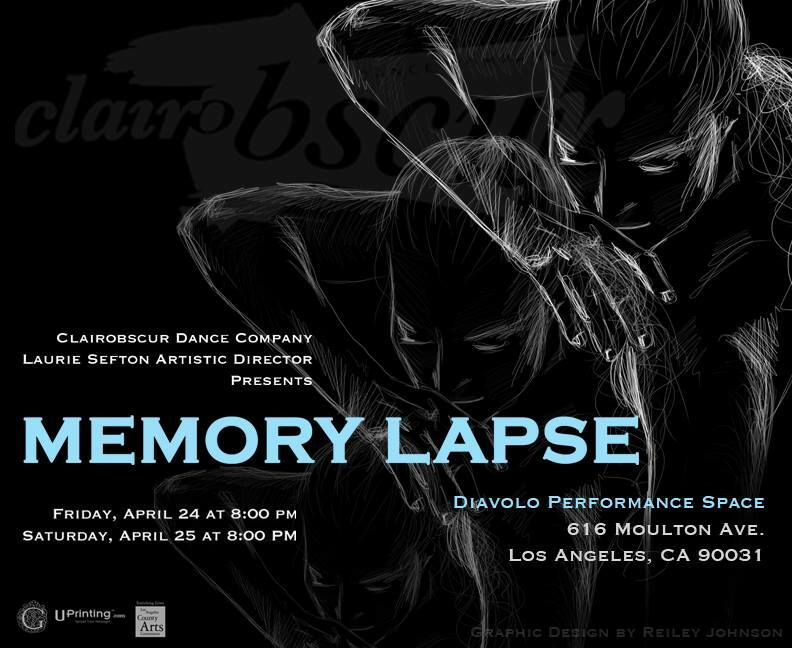 The second half of the show consisted of an evening length work entitled Memory Lapse, set to an original score by Bryan Kurt Kostors. Featuring Genevieve Zander and Damien Diaz, this piece told a different story of human beauty and tragedy. The piece began with a trio of women, Zander dressed in a lace shift and the others in light tunics and leggings. The relationship between the three was not immediately evident to me. I soon came to see the two girls as the daughters and Zander as their mother. To a certain degree, their connection was tenuous for me as they shifted in and out of unison, non-contact duets and solos. It wasn’t until over half way through the piece that the father figure, performed by Damien Diaz, entered. His surprising addition to the narrative was the crucial connection for the puzzle to come together. The narrative of dementia was firmly in place. The piece then played out sweetly as the mother danced a beautiful duet with her unresponsive husband. I was pleased that the narrative was not broken in favor of some wildly athletic love duet. Sefton showed her maturity and commitment to artistry in her choice to maintain the characters and work creatively within the confines of the situational narrative. The strongest section of this work for me was the touching solo performed by Zander. Stroking her neck as she noticed the signs of aging, there was a profound truth in this moment that surpassed all others- a simple honesty about our human condition and our own fragility. My only complaint about the evening was that the music was too loud at times, taking me out of the moment, but overall, the evening of dance was a great success, offering another voice to the tapestry that is the LA independent dance scene. A blend of impressive technique and intimate storytelling, Clairobscur is a company that celebrates the profound, the reflective, and the personal through dance.